Forever Afternoon demonstrates sure craftsmanship, sensitivity, and keen insight into the motivations and reactions of a variety of characters, sometimes presented with dramatic or narrative precision from their own point of view. When Adam David Miller writes from his own experience or imagination, the reader can identify with the universality of his perceptions. His lyrics are celebrations of life, a refreshing spectrum of simple and complex experience interpreted with a mature wisdom. Many of Miller’s poems have appeared in Neighborhood and other Poems, a chapbook, and numerous magazines and journals over the years. He is also editor of the anthology,Dices and Black Bones,and editor and publisher of Mina Press publications. 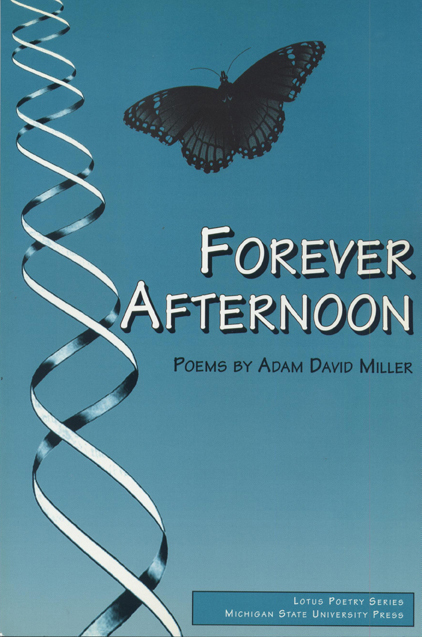 Forever Afternoon is his first major collection and is the winner of the first Naomi Long Madgett Award, sponsored by the Hilton-Long Poetry Foundation. Adam David Miller is a poet, writer, publisher, radio programmer, and producer. Born in South Carolina, Miller published one of the first collections of modern African-American poetry, as well as four books of poetry and a memoir about his life growing up in the Jim Crow South. For six years, Miller served on the Berkeley Arts Commission and helped inaugurate the Addison Street \u201cPoetry Walk\u201d in Berkeley's renovated downtown arts district. He has been a regularly featured poet on KPFA-FM radio in Northern California. Miller tought English literature and writing in the public schools and colleges in and around Berkeley, California.